Tremendous Church growth in the Dominican Republic has brought both blessings and challenges. Members and leaders on this Caribbean island look ahead with optimism. Ten years ago in the Dominican Republic, if you had asked someone on the street about The Church of Jesus Christ of Latter-day Saints, the response would probably have consisted of a blank stare. 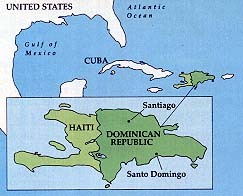 The small country sharing the island of Hispaniola with Haiti lies only six hundred miles southeast of Florida. But until 1978, the only contact Dominicans had had with the Church consisted of “the commercials,” as locals called them﻿—family messages advertised on television, sponsored by a church no one had heard of. Now, three stakes, two missions, six districts, and more than seventy wards and branches later, practically everyone knows about the Latter-day Saints. Church membership has grown from six members in 1978 to more than twenty-five thousand in 1990. In areas ranging from the Dominican capital of Santo Domingo to rural towns dotting the beaches of the Caribbean Sea, Latter-day Saints can be found among every social class and within every occupation. That impressive growth began in the summer of 1978 when two LDS families, one American and one Dominican, moved to Santo Domingo from the United States. The families began talking about the Church no one had heard of, and soon several families were baptized. Like members around the world, Dominicans enjoy the blessings of Church programs for families and the youth. But also like their fellow members, they struggle with challenges. They want to maintain unity as Church members and bridge gaps between social classes. They want to prepare their youth for leadership roles in a young church growing rapidly. They want to sustain their families economically. And they want to help women meet the challenges confronting women everywhere in the modern world. Some challenges are more difficult to resolve than others. Some﻿—like daily electrical shortages that can bring sudden halts to evening meetings and activities﻿—seem beyond their control. But by working together, everyone remains hopeful about a future that began with such a promising past. The unity and warmth among members attest to how they have worked to have “their hearts knit together in unity and in love one towards another.” (Mosiah 18:21.) You see it in meetings concluding with warm embraces, in district dances in which everyone joins hands and genuinely relishes being together, and in enthusiastic home and visiting teaching appointments between friends. But unity among members cannot simply be attributed to Dominican warmth and hospitality. Leaders and members alike work hard to maintain closeness and cooperation, a sometimes difficult accomplishment when people of every social class come together as they do in the Church. People who have otherwise remained distant from each other socially, geographically, even religiously need inspired leadership, and Dominican Church leaders such as Santiago district president Ramon Lantigua and his wife, Victoria, have provided just that. At any given activity for the Young Men and Young Women of the Dominican Republic, the leaders are there﻿—not just youth leaders, but bishops, stake presidents, counselors, and Relief Society leaders. While Santiago youth dance the merengue at a district activity, the district presidency can be seen coordinating the sound, even dancing on occasion. After seminary classes on Friday, a branch president cooks the students a Dominican breakfast sandwich of ham and melted cheese. As a Young Men president, Agustin Flete takes the same approach. “The only way that kids can avoid the things of the world,” he says, “is if they have the Spirit with them.” Consequently, he stresses the importance of honoring the priesthood, and plans service projects for the Young Men. Ana Mercedes Torres, Santiago District Young Women President, talks openly with the Young Women about the temptations they face and prays often for her youth. Dominican youth have responded well to such dedicated guidance. They make up 30 to 40 percent of the missionary force in both of the country’s missions. They hold responsible stake and ward leadership positions at age eighteen or nineteen. And they have shifted their goals to a gospel perspective. Ricardo Beato, nineteen, is typical. A first counselor in the La Vega Branch in the Santiago mission, he teaches an investigator class, heads the ward theater committee, and has changed his goals since converting to the Church. “Before I was a member of the Church,” he says, “my goals were like those of a lot of other kids’ goals here: I wanted material things. I wanted to go to New York and become rich.” Now he wants to serve a mission, attend a university, and raise a happy family. Jorge Dominguez serves as Santiago’s district mission president at age twenty-three. After joining the Church at fourteen, he graduated from seminary and served a mission. Now he attends college at the Pontificia Universidad Madre y Maestra, where he once answered his anthropology professor’s question, “Why are you Mormon?” in front of three hundred students. One student was baptized as a result. Church leaders in the Dominican Republic work hard to meet the needs of the poor and the needy. Members cooperate by assessing the needs of struggling brothers and sisters. For example, when one member’s child became ill, he was able to pay for the medical bills, but couldn’t afford medicine. Several ward members bought pills the child needed. Financial struggles also make it difficult for some families to go to the temple. While several Dominican families have gone to a temple in the United States, the easiest route is to go to the Guatemala City Temple. Still, the trip to Guatemala requires months and sometimes years of saving. Although only 5 percent of families in the Church have been able to go to the temple, they still prepare themselves to be sealed. Parents maintain a vision of eternity, participate in temple seminars, and hope for a temple of their own someday. “Fortunately for the women of this country,” says Aida Munoz of Santiago, “the Church helps every kind.” She refers to women who help provide for their families, women who can choose to stay home, women who are married, women who are single, and women who depend upon sisters in the Relief Society for moral support. “It’s impossible!” cried Faustino Tineo’s mechanic when Faustino told him he had thrown away all his cigarettes. “You’ve been smoking forever!” But whenever Faustino was tempted to resume his lifelong habit, he says, “I just said a quiet prayer, ‘Please Lord, help me.’” After Faustino had overcome smoking, he asked his wife, Emma, to give up coffee, their family’s last obstacle to baptism. The year was 1979. They had heard all of the missionary discussions and had been attending Santiago’s thirteen-member branch. Emma told Faustino, “I’m prepared!” and gave all of her coffee-making equipment away to the neighbors. On 8 January 1980, the Tineos and their two children were baptized. “It’s amazing that we would have the strength to join such a small church,” recalls Emma, “and to suddenly quit lifelong habits. The only thing I can attribute it to is the Spirit.” Indeed, the Spirit, observes Faustino, is the reason Church membership in his country has grown from the tens to the thousands. Austria uses her training in personnel management to work with ward Relief Society leaders. She offers mini-courses on effective ways to visit-teach, communicate as leaders, and set realistic goals. “I try to put into Relief Society all the things I’ve learned about working with people through my job,” she says. Elizabeth VanDenBerghe serves as Young Women president in the Granite Park Ward, Salt Lake Granite Park Stake. Her husband, Jed, is second counselor in the Granite Park Ward bishopric. Domingo and Rita Viviana de Cruz and family. Backdrop: Countryside outside Santo Domingo. Ramon and Victoria Lantigua. Martha Polanco. Santiago youth at a dance. Inset: An LDS chapel in Santiago. Backdrop: Interior of a chapel in Santo Domingo. Rufino and Maria Pena de Diaz and family, of Santo Domingo. Backdrop: One of Santo Domingo’s historic ports. Top inset: Santo Domingo youth. Bottom inset: A Santiago family on their way to a Church activity.